Ahead of an auction of works by some of the world's best-known illustrators, Quentin Blake talks about his work with Roald Dahl, and how he is taking art into hospitals. 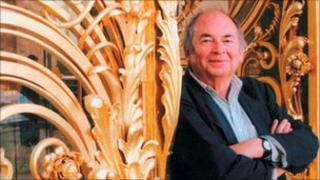 "I'm trained as a teacher, that's the only thing I've got a certificate for," admits Quentin Blake. "I haven't got anything for art!" Blake, who is best known for his famous illustrations of Roald Dahl characters like Matilda and The BFG, has rallied fellow artists to help raise funds for a centre dedicated to the art of illustration. The likes of Raymond Briggs, Eric Carle, Ronald Searle and Gerald Scarfe have submitted original works for the auction at Sotheby's. Blake has been a driving force behind the House of Illustration project. The building will be housed in the King's Cross regeneration area of London, and the charity is looking to raise more than £6.5m. "There is currently no building that says illustration over the door," says the 77-year-old artist on his reasons for supporting the project. He has promised the future museum his archive of original works, spanning some 300 books. "Our vision of it is of a very active place, not somewhere where you put away drawings and don't look at them. There are huge quantities of the illustrations of the past in the reserves of the great museums, but they don't have the chance to show it." Blake's own contribution to the auction is a watercolour of Roald Dahl's character, the BFG. His 15-year working partnership with Dahl is one of the best-known in publishing. Dahl would always refer to Blake as "Quent" and liked to poke fun at his white shoes. "That came with the territory." Blake slips into an impression of the late author: "Here's old Quent, he's taking her out to dinner and he's wearing his plimsolls." Blake slips his legs out from under the table and shows off his dazzling footwear. "I don't walk very well, they make me feel more fleet of foot, but they're not plimsolls!" Quentin Blake was born in 1932 and went to grammar school before studying English at Cambridge. His first drawings were published in Punch when he was 16. After National Service he did a postgraduate teaching diploma at the University of London. His first children's book was John Yeoman's A Drink of Water in 1960. As well as his famous collaborations he also writes and illustrates his own books, creating such characters as Mrs Armitage and Mister Magnolia. For many years Blake taught at the Royal College of Art (he was head of illustration from 1978-86). He became the inaugural children's laureate in 1999 and was made a CBE in 2005. After such a long career, is he taking any time out from illustration? "I draw every day - unless I'm being interviewed," says Blake. "What is nice is to have different kinds of things to do." He mentions his recent work in hospitals and mental health units. "It's a different kind of brief, a different kind of audience. A lot of the pictures I do in hospitals are to cheer up gaunt surroundings. "I'm just doing a maternity hospital in France. So I've got the full range of ages. These pictures are going to appear in the delivery rooms - so for some of these poor children it will be the first thing they see!" I remark that a great deal of Blake's illustrated characters - like Matilda and Mrs Armitage - seem to have an ever-present smile. "There are a lot of smiles about, it's true. People have come up and said thank you for your work - and joy is the word they've used, but I've also been reproached for it, for being too cheerful. "But if you add a a smile, it doesn't make it necessarily joyful." He refers to the doodles he does while on the telephone. "They are strange-looking monsters indeed - a lot of them are creatures of the desert: birds and animals hitherto unknown. They've all got problems of their own. "They haven't all got smiles." The 28 drawings in the House of Illustration auction are on sale as part of Sotheby's winter sale of English Literature, History, Children's Books and Illustrations on 16 December.